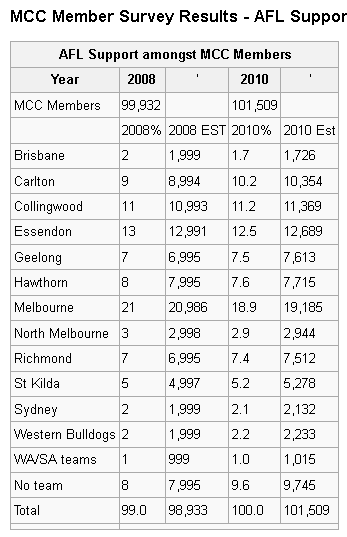 An analysis also shows that while Melbourne is still the most heavily supported AFL team among MCC members, the proportion on the Dees bandwagon has fallen from 23 per cent in 2006 to the present figure of just under 19 per cent. The big Victorian-based clubs are, unsurprisingly, next in line with the Bombers, Magpies, Blues, Hawks, Cats and Tigers well backed. Interestingly, more than 7700 members (7.4 per cent) have no team listed. While many of those will genuinely not follow a team (or AFL), we suspect a few of you have slipped through the cracks, so please visit the website or email the club with your nominated team.